Green Wave Art (CCCD Artspace) presents you the first Art Exhibition by Mr. Sanjay Bantawa from the Himalayas. Sanjay Bantawa is a well known visual artist with disability from Nepal. Sanjay suffered from polio in his childhood, but this has not stopped him from pursuing art. His body limitation let him put his emotional and cognitive focus on canvas, using his paintings to explore sorrow, pain and troubles. Sanjay is an expert in the use of colours. Bodies, horses and women have been his symbols which he mixes creatively, leading to boundless ideas and shapes. Sanjay pursues beauty, empowerment and freedom. As a freelance artist, Sanjay also works in the Lalit Kala Campus of Tribhuwan University as an Art teacher, contributing to the cultural development in Nepal as an active creator and educator. Together with the exhibition the Green Wave CCCD Artspace is organizing a series of activities including film shows, music and dance. 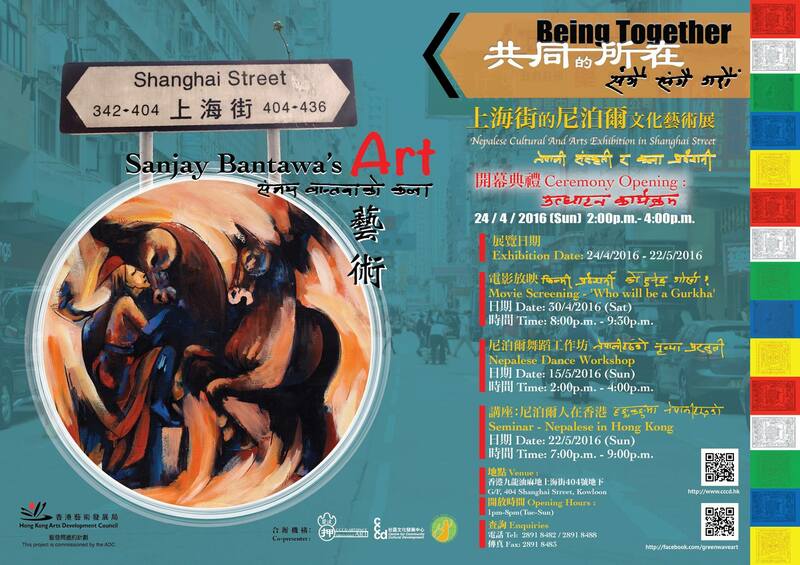 We hope that these will show the rich cultural landscape of the Nepalese in Hong Kong. For a long time, the sons and daughters of the Himalayas have made significant contributions to Hong Kong in different ways and many of them have become Hong Kongers, calling Hong Kong home. The opening ceremony of the exhibition and series of Nepalese Cultural programmes will take place in the Green Wave Art (CCCD Artspace), 404 Shanghai Street, Yau Ma Tei from 2 p.m. to 4 p.m. on 24/4/2016 (Sun), we earnestly hope that you will be able to join us!